Special thanks to Seamus (the dog) and the Cranbrook School Cheerleaders. Available at Amazon.com and other fine retailers. They were the typical American family on a typical American road trip—Dad behind the wheel, Mom in the passenger seat, their five adorable kids piled in the back. And, of course, their beloved dog strapped to the roof. 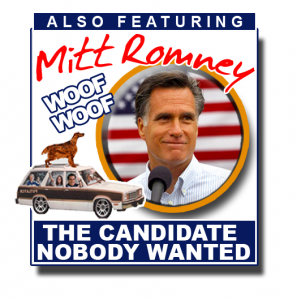 Now for the first time, here is the completely true—and only mildly embellished— shaggy-dog story of Seamus Romney, the famously fetching Irish setter whose master, future presidential candidate Mitt Romney, plopped him atop the family station wagon for that infamous 1983 car trip. From the majesty of Mount Rushmore to the fabulousness of San Francisco, from the sacred temple of Salt Lake City to the hallowed halls of Washington, D.C., here at last is Seamus’s rooftop account of that headline-grabbing journey . . . unleashed. Doggedly chronicled by satirists Bruce Kluger and David Slavin (NPR’s All Things Considered), and cleverly illustrated by Colleen Clapp (The Chris Matthews Show, NBC News), this American tale is more than just the story of a dog on a hot tin roof. It is the inside (well . . . overhead) look at the Man Who Would Be President and the wild ride that’s sweeping—and bewildering—the nation.